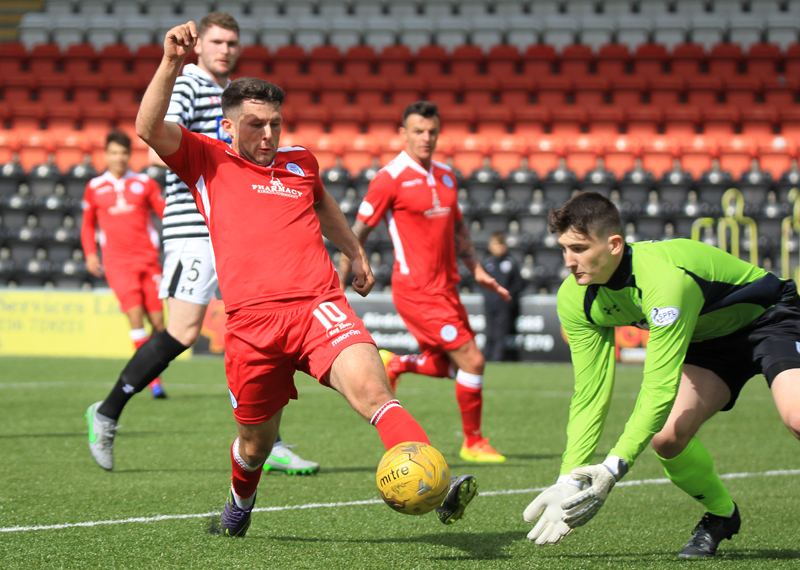 Queens kicked off their League Cup campaign with a comfortable 2-0 victory against Queens Park at the Excelsior Stadium. First-half goals from Jake Pickard and Andy Dowie put The Doonhamers in easy streets and the result never looked in doubt as Queens had several chances to extend their lead throughout the ninety minutes. The match was originally scheduled to be played at Hampden Park but after the national stadium was deemed unplayable on Wednesday, due to the grass being damaged from several concerts in the past month, the match was moved to Group E rivals Airdrieonians ground. This would be the second game in 24 hours to be played in Airdrie after Premiership side Partick Thistle squeezed past the Diamonds 1-0 on Friday. Gavin Skelton named five new signings in his competitive starting eleven this season. Lee Robinson, Jamie Hamill, Grant Anderson, Steven Rigg and Lyndon Dykes all made their debuts for The Doonhamers, Robinson making his third `debut` start for us. Queens started with a 4-4-2 formation. Hilson and Rigg starting up front, Anderson on the right-hand side of midfield with Dykes on the left. It was the new recruits who started the game brightly for Queens. Nice link-up play from Rigg and Dykes opened up space for Pickard and picked the ball up from 20-yards out and hammered a strike over Spiders keeper Andrew Murphy`s net. The goalkeeper was called into action two minutes later as he bravely collected the ball from the advancing Rigg, who looked destined to score. 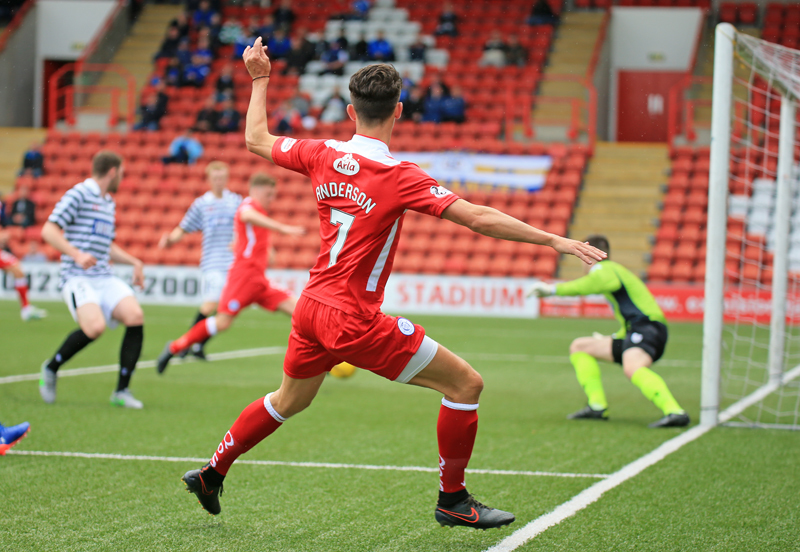 Skelton`s men had the majority of the ball early on and would have been a goal ahead if it wasn`t for Gregor Fotheringham`s block inside the penalty box, denying Pickard his first senior goal for the club. The Doonhamers were using the ball well and the pace of Dale Hilson was causing the Spiders backline problems. Hilson was brought down by Darren Miller on the left-hand side. Hamill swung in a dangerous free-kick and looked to be destined to meet Rigg but was deflected late-on by Bryan Wharton. Queens continued to ask questions of Gus MacPhearson`s side. Rigg was proving to be handful for Wharton and McGeever and his constant pressuring made Wharton concede a throw-in. From Hamill`s long throw, Anderson rose up and controlled the ball, cutting it to Rigg but the striker blasted his effort over the crossbar. It was Rigg again causing a nuisance for the Spiders defence after gathering the ball from Liam Brown he lined up a shot but his left-footed strike from ten-yards out was inches wide of the target. The Doonhamers hard work finally paid off on 26 minutes. Hamill released Anderson on the right-hand side, who sent over a driven cross that Jake Pickard smashed home from four-yards out, scoring his first ever senior goal for Queens. The visitors doubled their advantage eight minutes later. 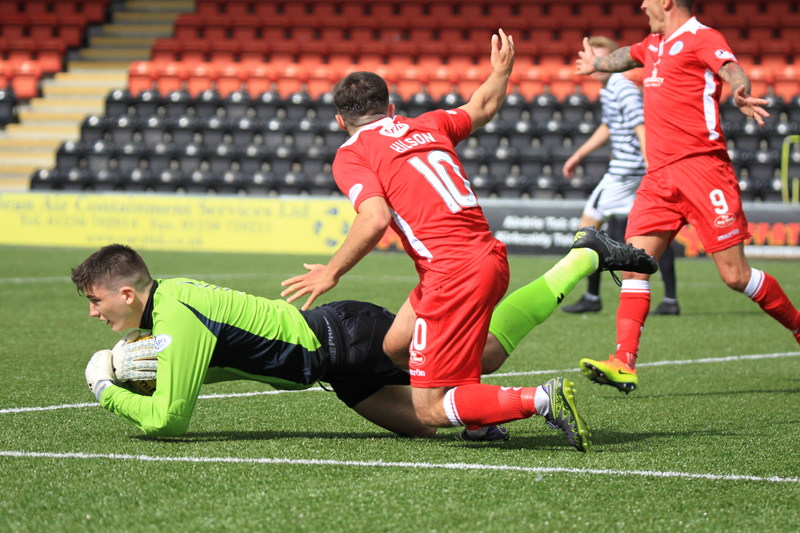 After Rigg pressured Queens Park goalie Murphy to concede a corner, Hamill`s set-piece was met by Andy Dowie and he headed home from 12-yards out. It could have been three moments later as Liam Brown lost possession in the middle of the pitch which opened up for Anderson, the winger waltzed past Millen but scuffed his shot wide of the post. Former Queens manager Gus MacPherson made two substitutions at the beginning of the second period. Mark Williams and Anton Brady on for Liam Brown and Gregor Fotheringham but it was the visitors who came close to extending their lead five minutes after the interval. Hilson`s quick free-kick found Anderson and he danced past two defenders into the penalty box, squared the ball to Rigg but the ex-Carlisle man snatched his shot wide of goal. The Doonhamers kept pushing for a third and this time Dykes found a hole in the Spiders defence but his shot was narrowly wide. Dykes had been linking up well with other newbie Rigg all afternoon and all that was missing from both players performances was that final piece of quality. Jake Pickard was the first man to go into referee`s Alan Newlands book after a late challenge on Wharton. Experienced right-back Hamill soon joined Pickard two minutes later, earning a yellow for clipping Darren Miller. The referee was in the spotlight once more on the hour mark. The impressive Anderson was too quick for the Spiders and looked to be through on goal but as he burst into the box, he was taken down by Wharton. Anderson looked to have been chopped down inside the box but referee Newlands disagreed and gave a free-kick, to the relief of half of the 410 in The Excelsior Stadium. Wharton was cautioned for his troubles and the following free-kick was skied over by Hamill. Gavin Skelton made his first change of the afternoon, the lively Steven Rigg making way for the evergreen Derek Lyle. Rigg had a good game and looks to be an exciting signing. Queens, in their red away kit, were dominating play without really getting out of first gear and could have added to their lead on 64 minutes. Hamill`s long throw was controlled excellently by Anderson but his shot was deflected over Murphy`s bar for a corner. Two minutes later, Callum Tapping joined Pickard and Hamill in the book after earning a caution for a foul on Paul Woods. Tapping was joined by Spiders midfielder a minute later for dissent. With some legs tiring, Queens made their second substitute of the afternoon. Dean Brotherston replacing Dykes and the youngster made an instant impact. Brotherston burst down the right-wing, leaving left-back Sean Burns at his bay, set up Anderson with an intelligent pass, who switched to Hilson, who delayed his shot and was crowded out by the Queens Park defence. 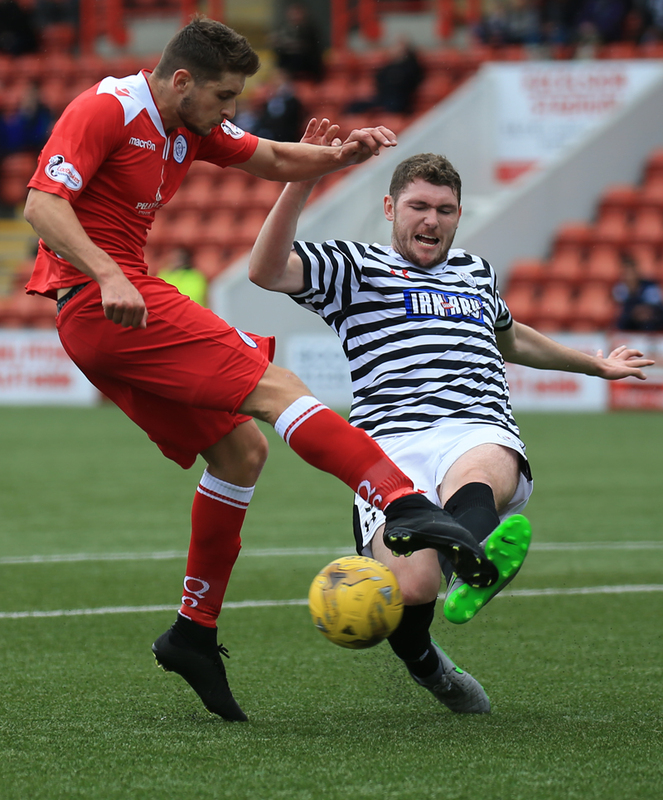 The former Forfar striker was in the mix of things again and did well to keep the ball in-play on the right-hand side, squaring the ball to Lyle but the veteran`s shot from eight-yards out dragged wide. Queens made their final change of the match, Kyle Jacobs replacing goal scorer Jake Pickard. The `hosts` were finally beginning to test the Doonhamers defence at the death. 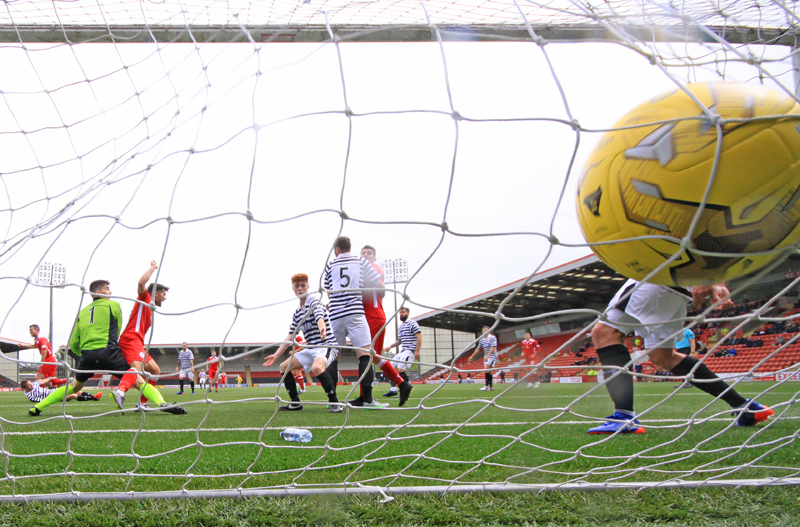 Ewan MacPherson`s first touches of the game almost claimed an elusive goal for the Spiders but the youngster couldn`t control the ball in the boc and the chances was scrambled away. 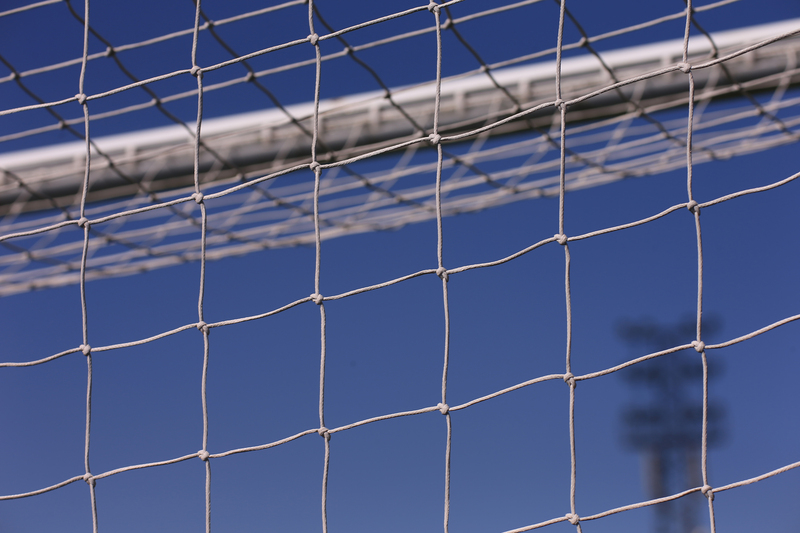 Midfielder Miller tried his luck from 30-yards out but couldn`t trouble Lee Robinson in the Queens net. It was a comfortable afternoon for Queens, who rarely showed any weaknesses in the ninety minutes. All of the new signings played well and all can take credit for giving The Doonhamers a perfect start to the League Cup campaign. 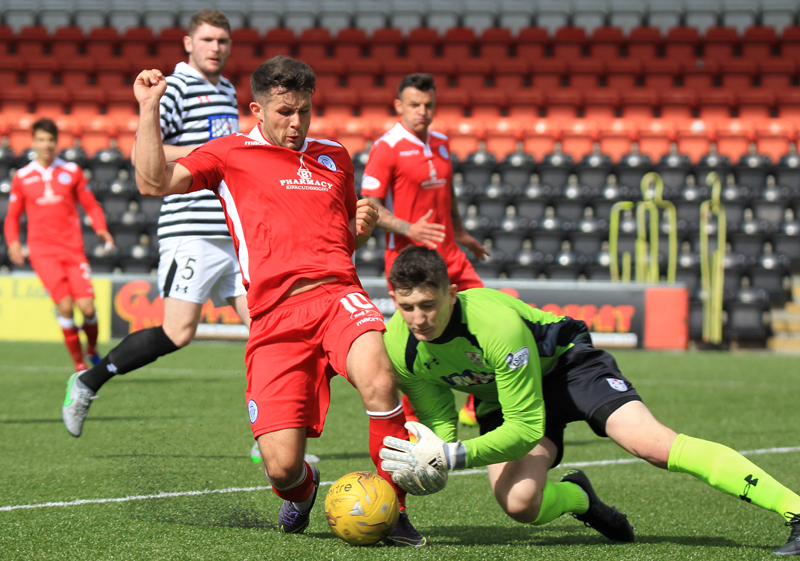 Queens welcome Airdrieonians on Tuesday evening at 7:45pm. 21:44 New signings Robinson, Hamill, Anderson, Dykes and Rigg make their first competitive starts for The Doonhamers. 22:00 The team`s are out and we are only moments from kick-off. 10 min Pickard`s strike is blocked by Fotheringham for a corner. 12 min Hilson is fouled by Miller and Hamill`s free-kick is deflected out for a corner. 16 min Ball falls to RIgg inside the box but he blasts his shot over the bar. 24 min RIgg gathers the ball and his 20-yard shot is just inches wide of the target. 27 min Pickard smashes home from close range after great build-up from Hamill and Anderson. 35 min Hamill`s delicate cross finds Dowie and heads home from 12-yards out. 47 min Queens Park make two changes at half-time. Brady and Williams on for Fotheringham and Brown. 50 min Today`s attendance is 410. 53 min Anderson skilfully dances past two defenders in QP`s penalty box,squares to Rigg but snatches his shot wide. 80 min Miller free-kick is blocked by Tapping out for a corner. 84 min Hilson keeps the ball in play, squares to Lyle but his strike is wide of the target.